At first glance, the idea of a sea crossing, even on a luxury yacht, arouses skepticism. Why on earth would anyone pay money to spend eleven days encased in a small container, bobbing around in the south Atlantic, without the distractions of shore excursions or varied ports of call? Why would anyone want to be nine hundred miles from the nearest landfall, completely surrounded by water that at this point is over three miles deep? The answer is one word: peace. Let me explain by way of example: As I boarded the ship, a harried gentleman, red faced, obviously wired, a drink in one hand and his cell phone in the other, was panicking because, while checking in, he had missed three messages. He spent the next twenty minutes huddled over his phone, trying to catch up. Three hours after we left port, he was no longer able to receive or send . The difference, when I saw him at breakfast the next day, was amazing. Now relaxed, outgoing and sociable instead of lost in work, he was discovering himself, his wife, and his surroundings. 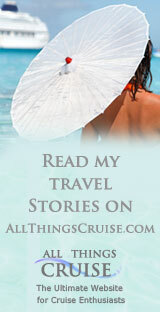 A repositioning cruise, such as the one I did on the Seadream 11, a 116 passenger yacht, is a special kind of cruise. Because many cruise lines have to move their ships from the Mediterranean to the Caribbean for the winter season, (and vice versa in the Spring) they often offer attractively priced voyages for the cruiser who likes the days at sea and doesn’t miss the port stops. My cruise was an eleven day voyage that left from Tenerife in the Canary Islands, stopped for the day at Mindelo, on Porto Grande in the Cape Verde Islands, and then sailed directly across the south Atlantic to Bridgetown Barbados. This is not the cruise for everyone. It suits me perfectly. I like people, love to have the time to listen to their stories and get to know them. I like the peace of being able to sit in a deck chair and read for as long as I want, without a cruise director trying to involve me in a shuffleboard tournament. Any one without the social instinct, anyone afraid of being alone with themselves, or, even more frightening, alone with their spouse, will have trouble with this cruise. But not me. It is a tonic, a cure for the hectic scramble of my real life. I begin to breathe more slowly, to be aware of who I am again, to get in touch. One gentleman on this cruise, a successful marine lawyer, was busily engaged in rereading all of Shakespeare’s plays. “I haven’t had a chance to read in years. In fact, the last time I read Shakespeare was in my school days,” he confided. Others found this cruise the opportunity to schmooze with business people from other countries, an investment banker from London, a manufacturer from Malaga, a developer from New Zealand, an entrepreneur from Australia. I’m a writer, so I collected stories. Like the one about the passenger, an elderly American gentleman who came on board with his teddy bear. The bear came to meals, changed into a tux for dinner, even had a place set for him at the table. On one cruise a woman arrived on board with a collection of white sheets which she used to cover all the furniture in her stateroom for the entire voyage. The cruise director, Helen, told me about another woman became ill in the middle of a crossing and had to be flown by helicopter, which was refueled in mid air, to hospital. “She credited the crew of the SeaDream with saving her life and sent a case of champagne to thank them for it,” Helen explained. There were many more stories, but I’m saving them for the novel I was inspired to write, somewhere around the 13th degree of latitude. There are activities on board, a putting green, a well stocked library, evening entertainers, lectures and classes, but I still enjoyed the restful quiet times onboard best of all. This is a small ship, so the sea is ever present in your awareness. With the trade winds at her back the SeaDream sailed with a stately calm, and I savoured the sight and sound and roll of the waves. There was nothing else around us, except the odd pack of flying fish and an occasional dolphin. Disembarking in Barbados was like waking up from a dream.